Gravity bongs were a staple feature in many vintage stoners’ parties due to their ability to elevate one’s high to new heights. Of course, nowadays we have all sorts of highly concentrated marijuana strains that don’t really need extra help to get you that next-level high. However, you can always hit a gravity bond for old times’ sake and we’re going to show you how to make one. There are basically two different types of gravity bongs; a bucket bong and a waterfall bong. A bucket bong is usually made from the bottom part of a 2-liter plastic bottle, combined with the top part of a 1-liter smaller bottle. The point here is to make the top smaller than the bottom. Next, you have to fill the bottom half of the bong with water while the top part is where the mouthpiece and the bowl will be. 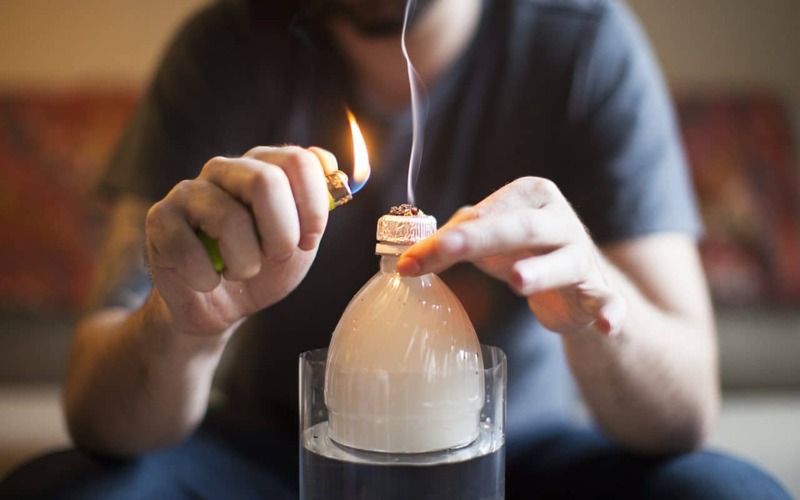 Ideally, you want to create a high-pressure situation where the top half is shoved into the bottom half of the bong. Then, as you pull from the lighted bong, a vacuum will be created from the smoke created by your lighter. By the way, it’s much easier to pull from a bucket bong than a waterfall bong due to the pressure created by the two halves. To make a waterfall gravity bong, you’ll need a large plastic bottle. Similar to the bucket bong, the top section of the waterfall bong will be made out of the bowl and the mouthpiece, while the bottom half will be a normal bottle with a bottom hole. The weed comes in through the cap, and when you take your finger out of the hole, gravity will take care of the rest. The result will be a dance between the water and the smoke which will look like a waterfall effect, but really what’s happening is that gravity is pulling the water out of the bong for you so that you won’t have to strain your lungs. With your scissors, cut out the very bottom of the small bottle and the top half of the large bottle. Cut out a hole in the bottle cap and create a bowl using the aluminum foil while making sure you poke holes in it afterward to help get the smoke into the bottle. Pour water into the large bottom half of the bong without letting it overflow, take the bottle cap off and put some ground up weed into the bowl. Place the small top half of the bong into the water and light it up while making sure to slightly tug at the top half of the bong as you pull it out of the water. Using your scissors, cut out a hole from the bottle cap and make a bowl using the aluminum foil. Again, be sure to poke holes into the bowl so that it’s easier for the smoke to get into the bottle. Last but not least, cut out a hole the size of your finger beneath the bottle and you’ve got yourself a waterfall bong!